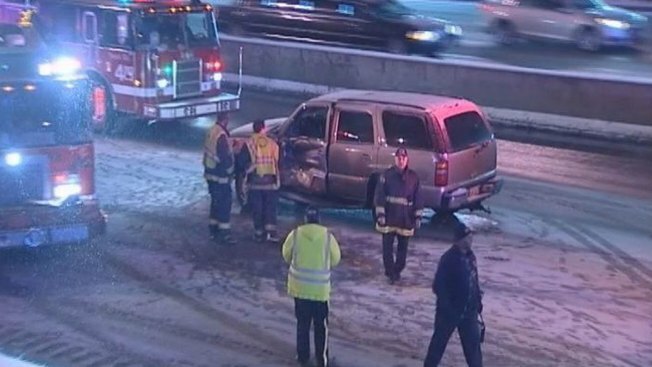 Icy conditions on the roads caused numerous accidents late Monday and early Tuesday, from Oak Brook to Chicago. No serious injuries were reported. The Department of Streets and Sanitation early Tuesday redeployed the entire snow plow fleet of more than 280 snow plows and salt spreaders to neighborhood and side streets. Spokeswoman Molly Poppe said plows would focus on salting neighborhood streets ahead of the morning commute. Resources would be adjusted as weather conditions dictate, she said. The city's snow plows are able to be tracked online at ChicagoShovels.org. Streets and San crews also update their efforts on Twitter at @StreetsandSan. Will Blizzard Be Boon or Bust for Delivery Services? Illinois Department of Transportation spokesman Carson Quinn said the agency had 400 pieces of equipment out on roadways. A traffic alert from Illinois State Police on Monday evening warned of several particularly-dangerous roadways: Interstate 80 between Interstate 55 and Seneca Road, Interstate 55 between Interstate 355 and Route 129, and Interstate 57 between Steger Road and Wilmington/Peotone Road. Trooper Dan Falat said there were "multiple" crashes and "several" vehicles in ditches along Grundy, Kendall and Will county interstates and routes. National Weather Service forecasters in Romeoville on Monday evening issued a freezing rain advisory for all Chicago-area counties until 6 a.m. That advisory was lifted by 3 a.m.
Snowfall throughout the area ranged from a dusting to 1 inch. O'Hare International Airport, where Chicago's weather conditions are recorded, checked in with 1 inch of snow. Still, the bit of snow is enough to leave untreated roads and walkways slippery. Drivers should always be extra alert and cautious in the less-than-ideal conditions. About 190 fights were canceled Monday at O’Hare and Midway airports, though largely because of the blizzard that pounded the East Coast and left tens of thousands of people without power.